The story of Indiana Girls Wrestling begins with two coaches, coaches who were looking for greater opportunities for their wrestlers than was available then to female Hoosier athletes. They each had walked similar paths of hope and disappointment as they sought to find additional avenues for training and competition for their girls. Fate intervened 26 December 2016, when the two first spoke about the possibility of creating a statewide organization to promote female wrestling in Indiana. Indiana Girls Wrestling was born from that conversation. 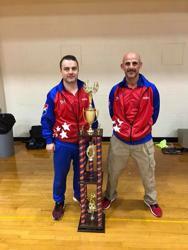 The next few months saw a flurry of organizational and recruiting activity as Coach DeLois and Coach Fauber attempted first to raise awareness about IGW and ultimately to build a team of participants to travel to their first competitive event, the USA Women's Folkstyle Nationals in March of 2017. That first tournament saw the IGW IGNITES compete with 14 girls, a remarkable culmination of three month's efforts. IGW IGNITES competed in 4 more tournaments that spring and throughout the summer. By October of that same year, IGW was able to field two teams with 32 girls in total at the USA Women's Folkstyle Pre-Season National Duals-and won it! In less than a year, IGW had changed the landscape of female wrestling in Indiana! Indiana Girls Wrestling invites you to join us as we continue to make history for our Indiana girls! Interested in becoming a sponsor of Indiana Girls Wrestling? Want to participate in your local community? Become a sponsor for Indiana Girls Wrestling and support youth in your area.